St Louis Anniversary Session. For sweethearts Kaleb and Ashley, taking refreshing and new photos of them as a couple isn't solely reserved for an engagement or a wedding. They were itching for the chance to take some cool shots and after being married for three years, they finally got their chance. The couple strolled through St Louis for eclectic and easy-going photos. This couple loves to smile and laugh. Ashley and Kaleb playfully interact as the photographer captures whatever comes natural. Ashley, with a gorgeous head of curly brown hair, wears a camel-colored jacket and skinny jeans while Kaleb sports a patterned sweater and dark pants. Up close, the photographer captures Kaleb nuzzling his wife. Ashley is able to grab his arm and the two show off their wedding rings in a natural and unassuming way. 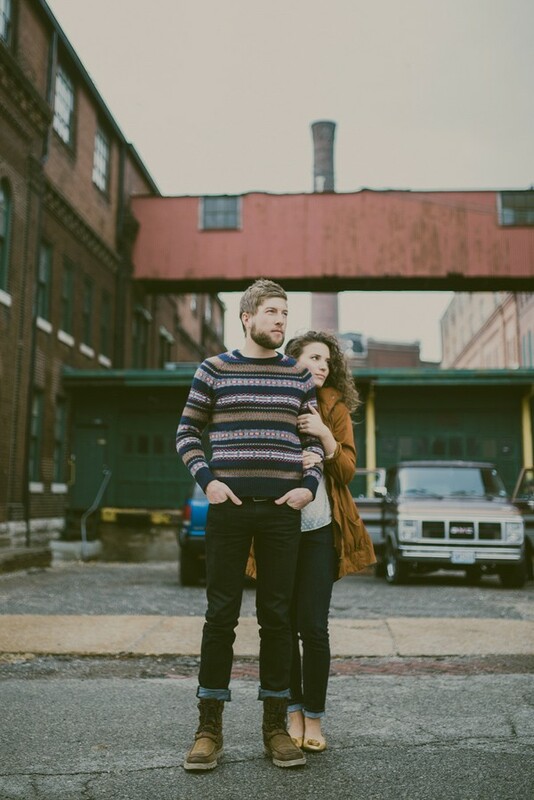 With an industrial building behind them, Kaleb and Ashley look serious but sweet as they stand in the street. The laidback atmosphere with the cars and smokestacks in the distance is unique and endearing. The couple makes an outfit change as they begin to make their way through a trendy neighborhood. Sitting in front of a brick building with green covered archway, Ashley sits on the stone ledge in a gray dress, black leggings and black booties. Kaleb changes into a green and blue flannel shirt and gray shoes to complement Ashley's look. They take additional shots walking down the street. The photographer adds some distance from the couple, who can also be seen gently kissing in front of a window. They make a final outfit change for the most artistic and emotional part of the session. Ashley wears a denim button-down shirt, black pleated skirt and silver beaded statement necklace. Kaleb looks handsome in a black jacket, pink patterned shirt and brown shoes. They can first be seen in a study, surrounded by an interesting collection of artwork on the walls and a desk full of plants and vases. The couple sits nestled together on a vintage couch. Next, they observe a collection of glass succulent terrariums hanging from curved tree branches. Ashley reaches out to them while Kaleb peeks from behind her shoulder. They also stand close in front of a large display of plants and succulents, while the photographer captures their choice of footwear. 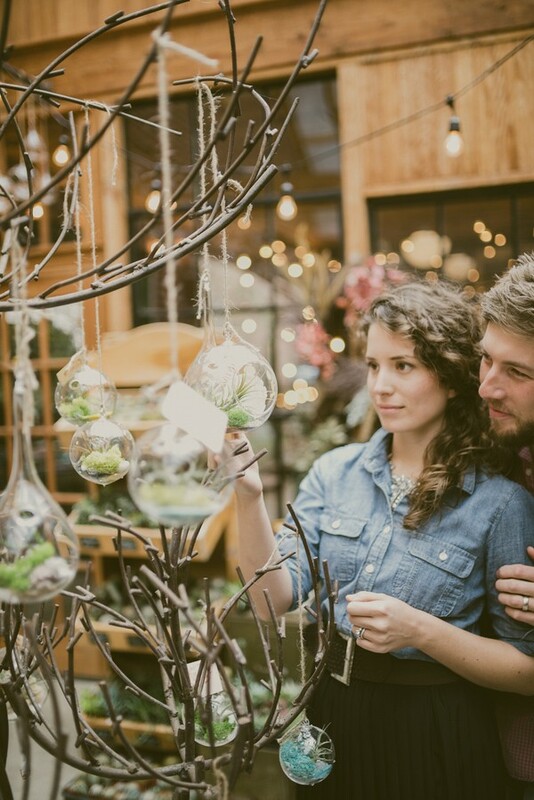 In a moment unmistakably genuine, the photographer peers out from behind the branches of the orb display to shoot the couple in the midst of a loving embrace, with Kaleb and Ashley leaning in for a kiss. The woodwork and frames surrounding them is a lovely and clever backdrop. 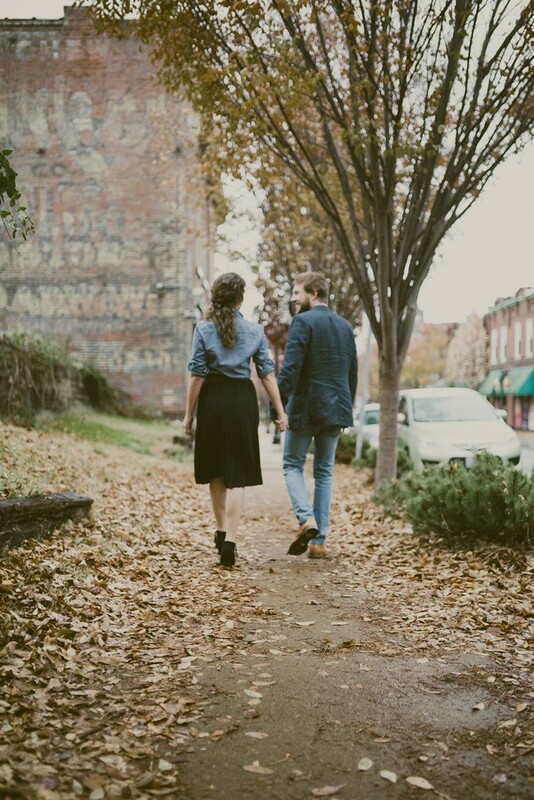 They continue their stroll through the St. Louis neighborhood as natural and easy as can be. The final shot shows a window's reflection, almost an intrusion, on a close kiss from Kaleb and Ashley with images of branches in the couple's silhouette. Life is too short not to have amazing photos of you and your significant other, no matter what stage of the relationship you find yourselves in. Ashley and Kaleb decided they wanted memorable photos that expressed who they are and most importantly, their love. Whether it's three years or thirty, always take the time to grasp those special moments on camera.